My mind is clogged with songs I can't seem to get out of my head. Words and melodies ping pong between It's the Most Wonderful Time of the Year and Anticipation. It's not anything new--it's the time of year I budget for starting around Christmas. I've been checking with my neighbor to see where we should go first on our plant crusades. Our mission: to bring back plants we know and love, those we've never tried, and repeats of those that might have died on our watch. Our first stop, Sunrise Greenhouse in Grant Park, IL is always the biggest. 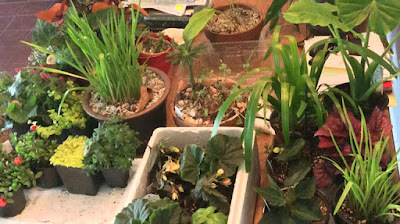 I came away with nearly a dozen hardy perennials, lots of Begonias, and assorted others that I'll play around with when it's warm enough to put them in the large planters on the patio. 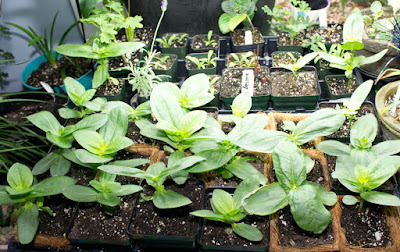 Zinnias are ready to go. The nights are still too cold for many of them though-- getting down to around 40 degrees F--and rainy. Springtime rain is probably one of the biggest threats to tender plants. Plants you purchase at the nursery are (hopefully) pot bound, or at least their roots fill up the pot. If the roots are healthy, they've found their way into all the pot's nooks and crannies. Plants with substantial root systems get thirsty when they're outside in a sunny, windy environment. In order to acclimate, or harden off, my plants, I put them outside in the shade for the first couple of days, gradually moving them into a partly-sunny location that gets maybe two hours of direct sun. If the plants' requirements include full sun, I'll move them further out into the sun every couple of days until they're out where they'll be on the patio, or otherwise getting a similar amount of sun as they'll get when they're planted. for when the temperatures warm up. I've got to remember not to water them late in the day. I imagine swimming all day in the hot sun, becoming exhausted from the exertion, and then coming out of the water when it's about dark. As kids, we would finally come out and shiver, our teeth chattering to the point we couldn't catch our breaths. I picture my plants doing the same thing, only it's their roots that can't catch a breath because they're encased in cold damp soil. 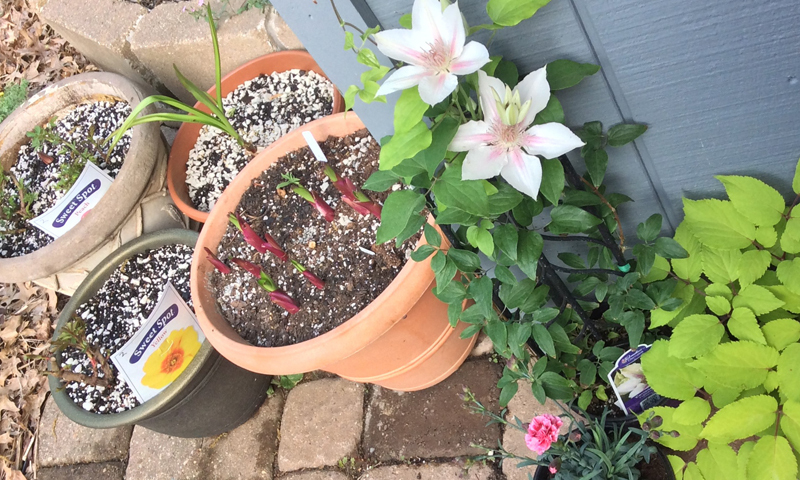 One of the pots I kept in the garage over the winter is rewarding me with hope for flowers and possibly even growth from a tropical plant in the center. 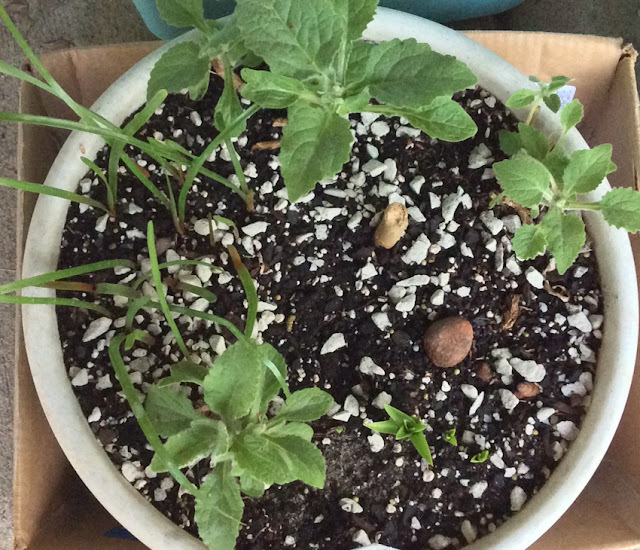 I started a foxglove--Digitalis 'Silver Fox' from seed last year, but it never bloomed. I'd combined the foxglove with a tropical plant, some rain lilies and something else, but I'm not sure yet what that is. I kept the pot in the garage for the winter, not expecting much. But I'm really excited to see the plants have survived! All in all, I'm anticipating a new and colorful season of plants from last year, this year, and even many years past. It really is that most wonderful time of the year. I love those first of spring plant shopping expeditions. Can't wait to see all your plants potted up and growing strong. We have been going through a cool spell. All my plants are shivering. Me too for that matter.